Like with my Galaxy S III, I decided to take a look at this official flip phone cover from Samsung for my Note2. Here is what I think of it after a few weeks of use. It replaces the battery cover in order to provider a slimmer fit. This means that the case barely adds any thickness to the device, which is great when you have a phone as big as the Note2! It is available in many, many different colours, this means your phone doesn't have to appear to be one of the limited colours that the phone is supplied in, it makes it somewhat unique. 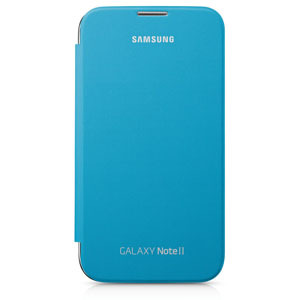 I own the blue (pictured above), I originally wanted orange but it seemed Samsung had trouble meeting demand for certain colours. Good Quality - the cover feels better than the one for the S III, I can't explain why, it just does. It has a nice soft interior and a textured exterior. Covers the notification LED, but not as badly as the S III - What I mean by this is you can still just about see the LED flashing on the speaker grill so it is not totally blocked. Not a smart cover - although strictly speaking this is a problem with the device not the case, I think Samsung missed a trick here, they knew before they designed this phone it would have a flip cover so why not add in the Smart Cover type technology as seen in devices like the Nexus 7 i.e. when the cover is closed the phone sleeps and when the cover is open the phone wakes up. It may have been that Samsung are keen to avoid areas that might open up litigation with a certain fruity company, but either way I am disappointed it is not there. You must remember that a flip cover is not always going to be every bodies cup of tea but I like it, especially when one is made as nicely as Samsung make these. They (in my opinion) are well worth the price to offer that stylish and slim protection for your screen plus gives a chance to change the colour of your phone.